Available for both interior as well as exterior applications, the high-performance doors feature excellent sealing capabilities that prevent wind, dust, insects, heat and cold from entering work areas. Numerous cutting-edge features built into the design of the high-performance roller doors make them ideal for universal interior use. These include innovative self-lubricating vertical plastic guides located in the side frames which combine reliable crash mechanics and low air permeability when the door is closed. “The curtain automatically threads back in after a crash, without production losses or repair costs,” explains Bram Janssen, Managing Director of Maxiflex. The doors’ space saving design incorporates thin side frames manufactured from galvanised steel with anodised aluminium cladding. The curtain made of resistant PVC fabric without a rigid bottom profile is completely flexible and is fitted with a zip closure system to increase wind resistance. 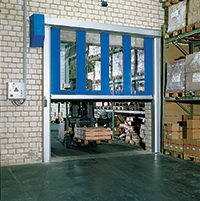 The safety devices on the doors are designed in accordance with the harmonised CE directives and product standards for powered doors. The doors are also quick and easy to install. Furthermore, the modern drive technology and MCS frequency inverter control system with integrated operation unit ensures rapid opening and closing. “All in all the doors provide effective shielding against dust, dirt, draughts, and moisture penetration,” confirms Janssen. Janssen also points to the doors’ stylish modern design, achieved by using flat aluminium slats and large windows that lend an attractive appearance and perfect integration into building facades. The doors are available in dimensions of up to 5 x 5m and double-walled aluminium slat curtain, optionally with windows or perforated slats; these designs ensure both good ventilation and noise insulation. Since opening its doors some 28 years ago to manufacture, supply and install Maxiflex PVC strip curtains, protection screens and impact doors under the name Janssen Products cc., Maxiflex rapidly expanded its product and service footprint. Today the company corners the Sub-Saharan market in high-performance industrial doors and loading dock equipment.